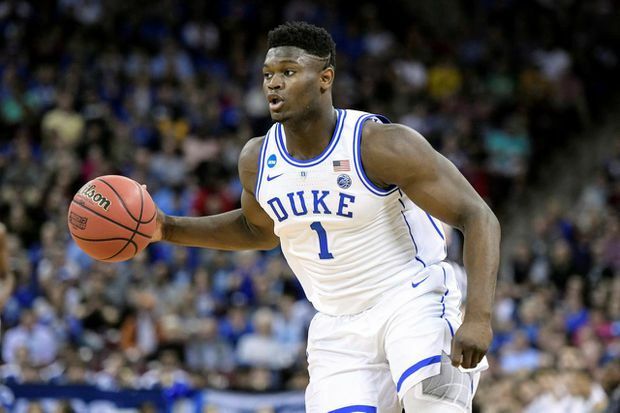 In this March 24, 2019, file photo, Duke forward Zion Williamson dribbles the ball against Central Florida during a second-round game in the NCAA men's college basketball tournament, in Columbia, S.C. The Atlantic Coast Conference player and rookie of the year averaged 22.6 points – tied for the league lead with teammate R.J. Barrett – and 8.9 rebounds. Along the way, he became the face of college basketball this season, routinely coming up with at least one highlight-reel play or show-stopping dunk a game. In one of the signature moments of the season, Williamson blew out his left Nike shoe – the PG 2.5, the signature shoe of Oklahoma City star Paul George – and sprained his right knee in the opening minute of what became a lopsided home loss to rival North Carolina. The effect was immediate – Nike’s stock price took a hit the next day, and the shoe company sent a team of representatives to campus to investigate. When Williamson returned roughly three weeks later for the ACC tournament, he wore a pair of modified size-15 Nikes from the signature line of Irving, a Boston Celtics all-star and former one-and-done player at Duke.